His exceptionally big biceps are famous, and it is always spectacular when Tyler Anthony shows and flexes them. This time for a series of new outstanding high quality photos published on AllAmericanGuys: a true gun show. 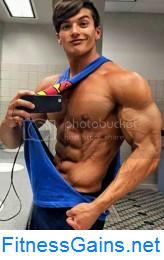 Moreover the popular fitness model demonstrates in many videos on AAG how he builds his biceps, as well as all other muscle groups which are sculpted as impressive as his arms. Version 9 of AllAmericanGuys: See the new look, items, and models here on AAG. 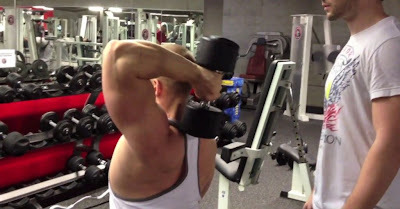 This is far more than a simple arm training video. Tuan Tran, the competitive bodybuilder and powerlifter, begins with a proper goal setting. 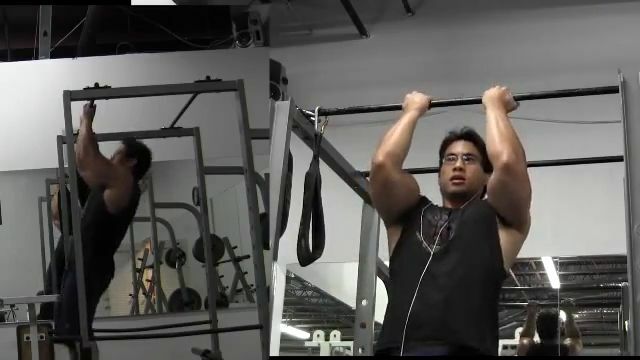 Then he demonstrates his biceps and triceps workout using cables, barbells, the preacher curl machine, chin-ups, and ropes. 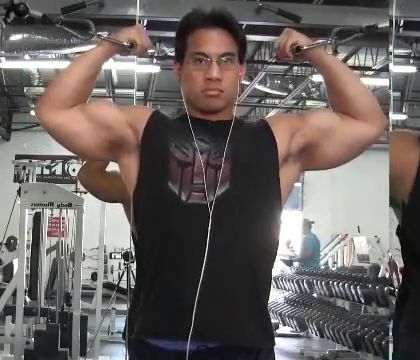 Finally Tuan explains his personal goals, his strength, and his weakness, and how he handles it to build imposingly huge and sculpted arms. It's better, if an undershirt does not cover his well-toned upper body. Admirably fit, athletic, adventure-seeking: Jay Parks is an aspiring fitness/crossover model, originally from the state of Michigan, now living in New York. He loves hunting, fishing and just overall hanging out in the woods - he's very much a 'country guy'. Jay also loves to workout and enjoys spending time with friends and family. He's not shy about showing off his body and enjoys the perks that come with being a full time male model. All American Guys' parent company Z Productions arranged for Jay to work in the big apple in 2012 as a fashion model, and so far he has been well received. Keep an eye out for Jay as he makes a name for himself in the industry. You find many high quality photos and videos of Jay Parks here on AllAmericanGuys. A tree with a massive limb: That's all you need to strengthen and shape your upper body muscles. 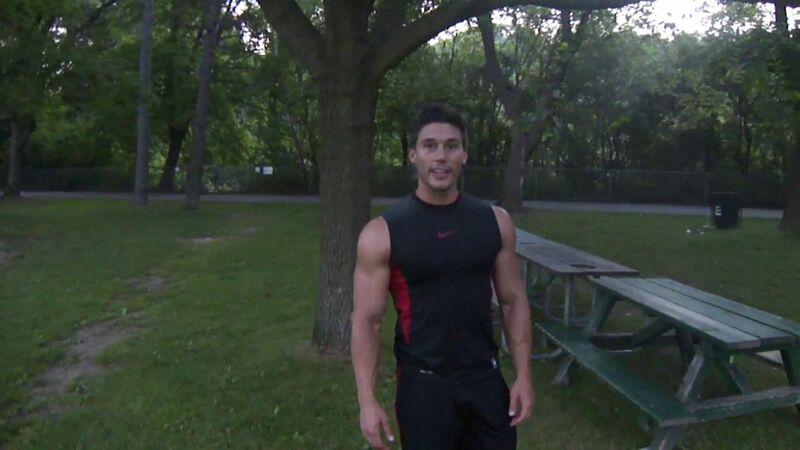 In this video fitness model and personal trainer Tyler Sarry works out in the park and demonstrates chin-ups with many variations. His Triple Threat Tree Trainng is easy to apply, effective, and funny. There is much more to Preston Noble than his spectacular calves. This amateur bodybuilder was a finalist for the 2012 BodySpace Spokesmodel Search, and he's only been in serious bodybuilding mode for about a year. Even before he started in the industry, this Arizona native was taking great care of his body. Now he clobbers weight in the gym and adheres to an honest eating philosophy based on sound science and his mother's good example. In this video you can follow his complete program - training, nutrition and supplementation - and find balance between brains and brawn. Super Powers: Hulk Smashing Powers! Athletic Background: I played basketball with my Dad and family all growing up and then played football and volleyball in High school. Ultimate Goal: Become free in all aspects of life through doing what I love most! A physique gets sculpted to win on stage: Pavel Samek, the successful bodybuilding competitor, demonstrates his contest preparation and comprehensive training in numerous high quality galleries and videos here on CzechYoungMuscle. Thrilling training, exciting posing: Vitek Sahula, the successful bodybuilding competitor (vice-European junior champion), demonstrates how he builds his winning physique and flaunts the effect of his workout in numerous high quality galleries and videos here on CzechYoungMuscle. Sleeveless shirts are made for guys with arms like his. Size: 17 inches. And when he is shirtless, workout enthusiasts will run to their gym to follow suit. Stefan Gatt, the young, blond muscle man, is a phenomenon: a stunning physique combined with a versatile, winning personality. He’s without a doubt one of the rising stars in the world of modeling. Stefan Gatt is poised to take the fitness world by storm in addition to making a splash on the silver screen. You find many high quality photos and videos of him here on AllAmericanGuys. 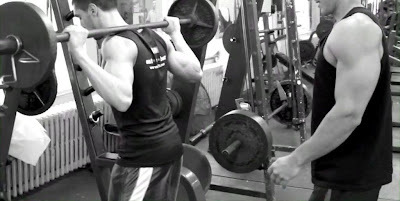 The full Triceps TNT Workout is available at http://www.GregPlitt.com. The GregPlitt.com Members Section contains 188 videos, including 54 instructional workout videos, $9.95 a month for full access. 1. "I'm a health expert." Personal training is more popular than ever. The growth has fueled competition among trainers who are battling to stand out. The latest way: specialization. Trainers offer expertise in such areas as injury recovery, cardiac rehabilitation and the condition du jour: diabetes. And yet not all so-called specialists are properly trained on the fast-and-loose end of the spectrum. Some certification requirements are as minimal as a $500 fee and the passing of an online exam. 2. "I'll push you ‘til you pass out." Given that 37% of health club members are beginners, personal trainers are largely catering to the unfit. They're reaching out to seniors as well, especially since clients 55 years and older constitute one of the fastest growing segments. Many trainers are guiding clients by using a less-than-gentle hand. The majority of people who come into the club haven't worked out since their high school gym class. So, if you feel your trainer is being too tough, speak up. Remember, you're the boss. 3. "Caution: Does not work well with kids." One of the biggest trends in fitness today is to enroll Junior in a little one-on-one training. Concerned about their kid’s weight and lack of physical activity, parents are increasingly turning to personal trainers at rates of up to $60 an hour. This niche is growing because our kids are. But not all health clubs have trainers who work well with kids, or who even know how to safely work out with them. Even a good trainer with the wrong attitude can turn impressionable kids off to working out. Bottom line: Be selective. For starters, ask for a trainer with a background in teaching, coaching or child development. And if your kid is involved in a particular sport, requesting a trainer with a similar background can help develop specific muscles and prevent injuries. 4. "Bring a few friends and I'll charge you half price." Fees for personal trainers can be pretty steep. But with most trainers there's a way to save 30% to 50% if you know what to ask for. Most personal trainers offer group sessions at a discount. And while health clubs won't typically dangle the group option in front of you, most personal trainers will work something out if you ask them. After all, it's a win-win situation. And it could mean a better workout: There's a lot to benefit from group camaraderie, as long as you don't need a trainer counting every rep you do. 5. "If I let you use the equipment, you'll realize you don't need me." Trainers are sometimes told not to spend too much time teaching clients how to use the big equipment for fear that once they get comfortable, they'll want to go it alone. That's why trainers might emphasize coordination exercises and rely on smaller props like stability balls, resistance tubing or bands, and balance tools; the three types of gear most frequently used by trainers. This type of "functional training" helps prep clients for popular recreational activities like tennis and skiing, as well as basic movements like bending down during household chores. But larger equipment also has its benefits; it can bring speedy results in strength-building and help keep off weight. 6. "I love to talk about you." 7. "I'm just as qualified to train you as that guy lifting over there." The personal-training industry is practically swimming in credentials, with more than 70 certifying organizations to date. There's no standardized testing in the industry; applicants often can get away with taking either a weekend course or even just an online exam before calling themselves personal trainers. Find a list of programs with third-party accreditation from the National Commission for Certifying Agencies. Industry experts point to the American College of Sports Medicine and the National Strength and Conditioning Association as two of the most reputable organizations. 8. "Just because I'm more expensive doesn't mean you'll get a better workout." Personal trainers charge more depending on their level of experience and how busy their schedules might be. Therefore, any fees you pay them are obviously an investment in your health. Nonetheless, a more expensive trainer won't necessarily yield better results. At the end of the day, it's about behavioral change. So safety aside, finding someone who personally motivates you and with whom you click is most important and that person may not be a top-dollar seasoned veteran. To find the right match, ask for a trial workout session with a trainer before you hire one. Have a preliminary consultation, which should include no exercise but rather an in-depth conversation about your personality and goals. Ask pointed and direct questions. Such as: Have you worked with someone like me before and been successful? If the answer is yes, request a recommendation from that person. 9. "Once I get my big break, I'm gone." The personal-training industry has high rates of employee turnover, partially because of low salaries. Plus, the flexible nature of the gig attracts those who want to work part-time while following other pursuits, like acting or dance. Unfortunately for you, when your right-hand man lands a callback audition that conflicts with your next appointment, you're the one stuck rescheduling or settling for a substitute. To help avoid future disappointment, ask about your prospective trainer's intentions and long-term career goals, especially if you're interested in purchasing a bigger package of sessions. 10. "I'm not a nutritionist, but that won't stop me from telling you what to eat." Personal trainers have been pushing protein powders and meal replacements for years, but now many are playing nutritionist as well. Not only that, but if you're facing certain health issues, nutritional advice given by trainers can sometimes do more harm than good. Buyer, beware: Before agreeing to alter or supplement your diet based on a trainer's recommendations, ask lots of questions, and keep your doctor in the loop. The best personal trainers don't pretend to be health professionals, but they are happy to facilitate an open channel of communication between a client and a health-care provider if the situation calls for it. About the author: Ken Hunt is the owner of New York and Miami's Steel Gym, an AFI-certified trainer and a fitness expert with expert advice featured in the New York Times, Compete, Horizon Barcelona, La Cosmopolatina, Men’s Fitness, DailyBurn, SiriusXM and LA Talk Radio. He travels around the country lecturing on physical fitness and is currently finishing his new book, The Hunt for Fitness; and hosts his own radio talk show by the same title on WWRL 1600 AM radio at 10 p.m. ET, every Friday. Under Ken’s management, Steel Gym has been named two years in a row the Number 1 gym in New York by the American Fitness Institute; two years in a row awarded the New York Award for Physical Fitness Facilities; has been named one of the Top 5 gyms in the U.S. by Muscle & Fitness Magazine; and has been given the Talk of the Town Award three years in a row for Outstanding Customer Service. Steel Gym is located at 146 W. 23rd St. in Manhattan. Call (212) 352-9876, e-mail info@SteelGym.com, or log onto www.SteelGym.com for more information. You can also follow Steel Gym on Facebook.com/SteelGymNYC and Twitter.com/SteelGym. As if Tarzan himself was working out in the gym. 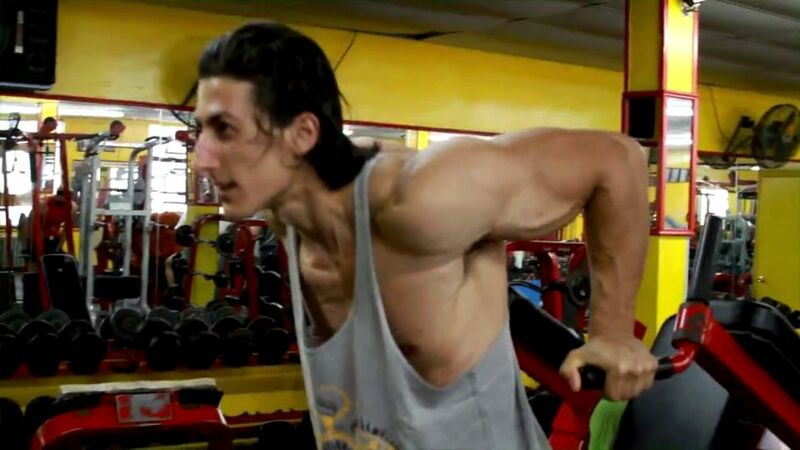 But Sadik Hadzovic is not a jungle fighter, he is a fitness champion and a successful men's physique competitor, and these videos show his intense training and preparation for the 2012 NPC Jr Nationals in Chicago: biceps, triceps, back, and much posing after each exercise. His t-shirt covers far more than striking washboard abs and massive pecs. When fitness model Nick Cooper takes it off and poses, he shows that he is excellent at building defined muscle mass and sculpting his body. Nick displays his physiqual progress for numerous new high quality photos and videos published here on AllAmericanGuys. A very effective exercise to sculpt arms, performed with strength, dedication and power: Tawab, a teen bodybuilder, uses hammer curls to build big biceps. This video was shot towards the end of the workout after heavy bench, heavy deadlifts and heavy barbell curls. This time he surpasses himself, when he takes off his shirt and shows his physiqual achievements: much more lean muscle mass than a couple of years ago, striking definition, perfect proportions, and a handsome look as always. Jakub Haspl's comeback is imposing, and his new shape is truly winning: After a break of two years he competed again, won the Bohemia Junior Bodybuilding Championship, and even became Czech Champion (junior class). Jakub, born in 1990, loves movies, and enjoys producing his own films and videos. Beside bodybuilding he likes soccer and table tennis. He displays his magnificent physique on CzechYoungMuscle. You find numerous high quality galleries and videos of Jakub Haspl here on CzechYoungMuscle.